It’s HeartUnions Week – a TUC campaign to raise awareness of the value of unions – and my union, the NUJ, is taking part. So I had a think about why I love my union. So what has my union done for me? Showed I am a professional. As a young freelance writer, I was proud to join the union – it showed I was serious about what I was doing. Helped me learn new professional skills – starting with training courses in desktop publishing and ‘internet research’ in the last century (VERY last century!). Helped me learn new life skills – providing a safe place to do scary things, like chairing branch meetings and debating at the national Delegates’ Meeting. And later, gave me the chance to encourage younger colleagues to do the same. Supported me through the redundancy process. When I was made redundant, provided me with a free place on a ‘Pitch and deal’ training day – a big help when starting out again as a freelance. Gave me some fun and made me some friends. But it’s not just about what you can get out of it: joining a union is about solidarity. It allowed me to be part of a movement that I believe in, working for the common good. It took me a while to work out why HeartUnions is taking place now – because 14th February falls this week (duh!). The Climate Coalition’s awareness campaign Show the Love. International Book Giving Day. New to me, but I like the concept. 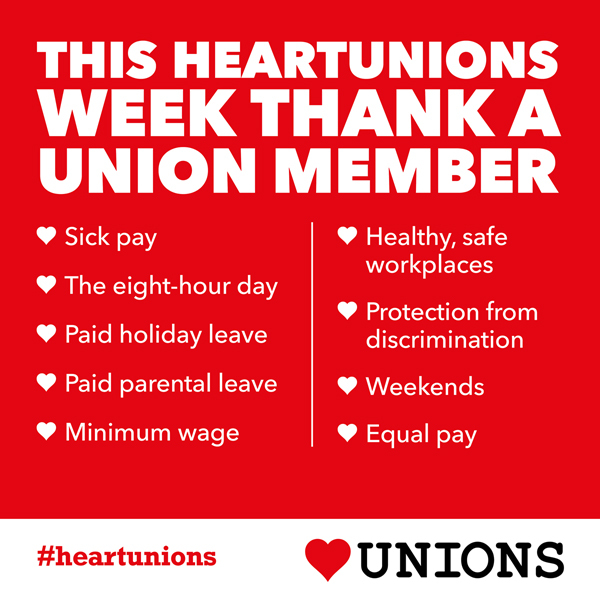 And going back to HeartUnions, I liked this message from the TUC: thank a union member for the benefits you enjoy at work.